With a quarter of a million fans packed to the rafters on race day, Jerez is a circuit now synonymous with the sport of MotoGP. On April 27th, riders from around the globe will descend on this beautiful city – one that has the added benefit of year-round gorgeous weather – and spend their days getting used to the track once more before Saturday comes round and the qualification practice starts. This first test for them all is the attempt to become one of the front-row starters for race day on Sunday. The 2012 MotoGP event in Jerez de la Frontera comes to a head at 2.00pm (local time), when the Spanish Grand Prix`s 21 riders will fire up their engines and try to win those crucial 25 points. Last year`s MotoGP was overshadowed by the death of Marco Simoncelli in Sepang fears of the safety of the Japanese track following the tsunami`s devastating effects on the Fukushima nuclear power plant. However, this year`s Grand Prix is shaping up to be one of the current front-runner`s favourites. Casey Stoner goes into this year as MotoGP leader, with a stunning 90-point lead over closest rival Jorge Lorenzo, but the Australian will definitely not have it easy. It`s been three years since anyone other than Lorenzo has won on the Jerez circuit and Stoner has never taken the top position on the podium there. In fact, it`s been over a decade since a rider from anywhere other than Spain or Italy won there! So the home advantage might prove to be more than a myth for this European leg of motorsport`s most exciting competition. But the weekend isn`t just about what goes down on the 2.7 miles of track. 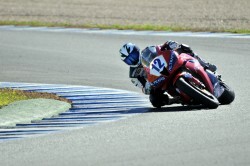 If you are a big MotoGP fan, then you can`t do much better than spending the weekend in Jerez de la Frontera. The stunning weather should be incentive enough, but there`s more to the city than that. The ancient buildings of the region are a delight for lovers of architecture. Those seeking something a little more relaxing after the race should make their way to the Arabic Baths of Hammam Andalusi. The hot and cold pools, the massages and the tea room are enough to bring you down from the excitement of watching Lorenzo, Rossi and Stoner thrash it out on the 26-year-old track that brought you to the city in the first place. There are many good hotels in the area, ranging from the budget end of the market right up to five-star luxury. MotoGP fans will descend en masse on Jerez de la Frontera in April, so it`s also probably a good idea to book early.